In this article, you will learn about the “Ecommerce” section of product details page. This section is used when you are creating an eCommerce product. Uncheck the “Disabled” checkbox. Price: Enter Ecom listing price and specify currency. This is the general price that buyers will see when they visit this product page on your eCommerce site. Alternatively, you can leave this field blank and use the Auto-pricing found in Control Panel Step 17. By default eCommerce takes its quantity from the available section, if in Multilister then it will pull from the Currently Listed column. Category: Choose an e-commerce category for your eCommerce product. eCommerce categories are set up in Step 18 of the Control Panel. Once created they will then appear here. Category 2(optional): Choose an optional category for your item. Search-Engine friendly page URL: The search engine friendly page for your eCommerce product. This field will auto-populate from your product title. Inputting dashes (-) wherever there are spaces in your title. Home page Featured: Enable this feature if you want to use this listing as a home page featured product in your eCommerce site. This way your listing will appear on the Homepage under “New Products” section of your webstore, thus increasing its visibility. Category featured: Enable this feature if you want to use this product as a category featured in your eCommerce site. Once you go to the category of this product in the webstore, the product will appear under the “Category Featured” section. SEO title: Enter a specific title that will help buyers find your product easily on search engines. It’s what will be shown once this page is indexed by a search engine spider. Meta Description: Specify a short and compelling description that will draw prospective buyers to your site. The description you enter will appear on search engines page results. Be sure to use ONLY relevant keywords to your product which will maximize click-through rates on search engines page results. Meta Keywords: Meta Keywords are a specific type of meta tag that appear in the HTML code of a Web page and help tell search engines what the topic of the page is. Input ONLY relevant keywords to describe this product, each product is unique therefore do NOT use the same keywords for all your products. Keywords must be separated by a comma. For example, when selling a ‘Smartphone’ you may use: ‘Apple, iPhone6, 64GB, White, Gold, Unlocked, Smartphone, New’ etc. 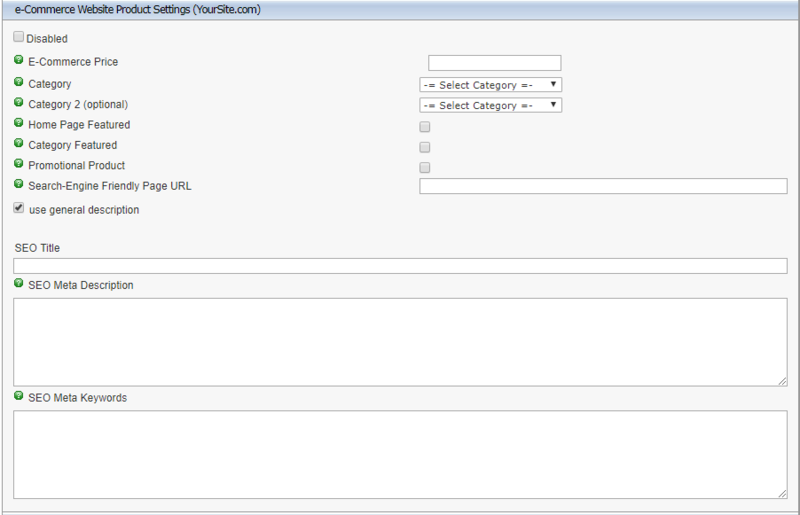 Your page will appear in search engines when someone types in a combination of these keywords.